When it came to standing for the rights of others, Frankie Rivera could be counted on. A dedicated activist who attended numerous marches and demonstrations throughout the San Francisco Bay Area armed with his Native American drum and long braided hair, Rivera died on Aug. 29 of brain cancer. He was 38. Born in San Francisco’s Mission District, Rivera grew up at 22nd and Florida streets, just two blocks from where Ysaguirre’s family lived. 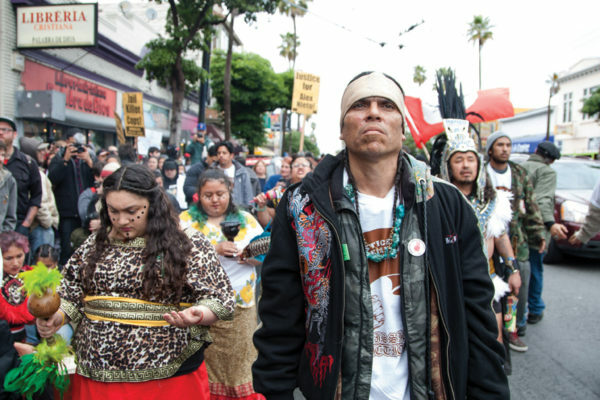 Rivera was often seen prominently marching with the help of a prosthetic leg—whether it was up Bernal Hill demanding justice for Alex Nieto, protesting outside of Local’s Corner after the restaurant refused to serve Sandy Cuadra and her family, or protesting alongside AIM-West members against the oppression of indigenous peoples. Rivera wasn’t always an activist though. A man of Navajo and Taíno ancestry, Rivera didn’t meet his biological mother until the age of 15, and was serving a 10-year prison sentence by age 19. “I always deep down inside had the spirituality inside, but lived a thug life of crime,” Rivera wrote on his Native American Prisoner Network profile while still incarcerated. It was in prison where Rivera learned about his roots from fellow Native Americans and decided to dedicate his life to activism. Lee Polanco, an elder with the Texas-based Coahuiltecan tribe who has counseled Native American inmates across the country, first met Rivera at the California Medical Facility, a state prison in Vacaville. One day when he entered his office at the prison, Polanco noticed a young man cleaning the floor on his hands and knees. Polanco later learned that man was Rivera, and grew curious as to why the active Rivera wasn’t participating in the sweat lodge ceremonies. He later learned that Rivera had HIV, and that he didn’t want to make the other inmates feel uncomfortable by smoking from the same pipe. After being released from prison, Rivera met his girlfriend, where the two began a long distance relationship about nine years ago. “It just hurts that he’s gone. And I didn’t get a chance to see him, to hold his hand and be there for him. I didn’t get a chance to tell him face to face that I love him,” she said. She recalled their early years when Rivera would talk at length about the American Indian movement, even educating his girlfriend on her own native Taíno history. She also remembers their most recent conversations, where Rivera revealed his struggles to find food to eat and about being taken advantage of by roommates. “It hurt me so much to hear him constantly say he was lonely. He wanted to see me, and I was struggling to get to him. But I couldn’t,” she said. Fighting her own battle with papillary thyroid cancer, she had planned to make the lengthy trip from New York to California to visit with Rivera. Her health however never allowed for that. Rivera is survived by his mother Laurene Killip, father Frank, step mother Linda, sisters Alicia, Celia, Josephina, Jasmine, Iesha and Celina, brothers Remo, Shaw and Bobby, and numerous other friends and family. For those who wish to donate towards Rivera’s funeral and medical expenses, visit gofundme.com/xa2yzuqk. I feel like ice. Here in my chest I bear a void where my heart used to live…now what in an instant had become vacant here in this void a new and deep embedded pain has settled. Wiping away my tears & telling me You loved me…Here where all our memories lay there is turbulence…swirling like a typhoon. So the pain then intensifies & the turbulence gets worse. Now ripping apart those frames & tearing my walls down…sending them flying out into oblivion. Only You can save me…You are My Heart…Without You I can’t be put together. My life shatters and glistens like black ice in the pale moonlight…leaving little glimmers of hope that maybe one day You will come back to me…Until then I will live out the rest of this nightmare until You come & wake me up. “Nanichi…Da Cuyo…Da Guey…Da Kai…Da Karaya…Da Tureygua…Turey…Ki’. Wait for me. Thank you for writing this lovely message. We have shared this on Frankie’s Facebook and the community.